The new set from Pro Art Models from Belgium is designed to convert Tamiya M1025 Humvee kit to Dumvee ("D" for "desert") variant used by US Special Forces. Such vehicles are used both in Afghanistan and in Iraq. As far as I know these are standard M1026 vehicles (same as M1025 but with winch) extensively modified in US Army workshops. As Dumvees are not factory configured vehicles, there are some small variations in their equipment, but vehicles are pretty much standardized. I read that recently Military Systems Group company started to deliver pre-configured vehicles to US SF, and these Dumvees are significantly different from those used now. 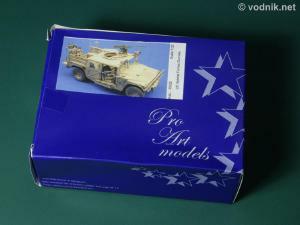 But Pro Art set is meant to represent earlier variant, as used during OIF. The set comes in a small box made of stiff paper. It is a neat box, but cardboard box would be better as the box I received was slightly squashed in transport despite being packed inside bigger cardboard box with styro chips inside. Luckily no parts were damaged. On the box is a little label with a photo of finished model Inside the box is a single plastic zip-bag with all resin parts inside. We also get double sided A4 sized instruction sheet. On it are seven construction steps shown on very clear pictures. Resin parts don't have numbers assigned, but they are presented in such way in instructions that it is very easy to identify each of them. - front winch with a cable and hook molded on. Instructions suggest that brush guard for the front of the vehicle should also be provided as resin part, but it was not included in my set. I don't know whether this part was intentionally not included (error in instructions? ), or was it a packing error. 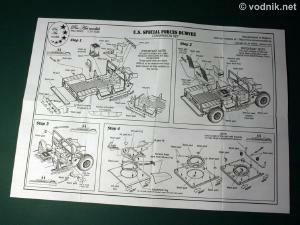 It shouldn't be a problem however as there is a brush guard included in Tamiya model and it can be used instead. Resin parts are well cast, but there are quite numerous air bubbles in them. Most should be easy to fill, but some can cause a lot of problems to fix. There are also some which damaged surface details. For example bolt details on rear compartment fences in my set were not properly molded. There were a couple of parts which were either not fully molded or small pieces of them had broken off (but these missing pieces were not in the bag, so it was not a transport damage) - these included one of the rear bumper shelf supports and one of the rear fences. 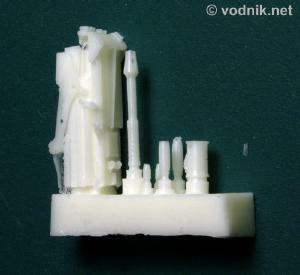 Parts are only slightly damaged and it should be easy to repair them with pieces of sheet styrene. There is some flash on parts, but not much and it should be easy to remove. One of the rear fence parts is slightly warped in my set, but I expect it to be easy to fix using some hot water to slightly soften the resin. 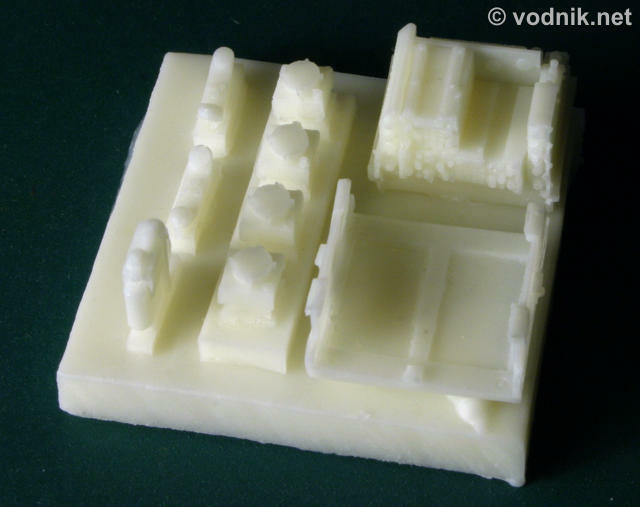 Most of the parts are included in the set with their casting resin blocks attached and removing them from some parts may be difficult. I predict that a lot of careful sanding will be needed to free some parts without damaging them. in the middle of it is slightly too wide. Mk.19 grenade launcher. Looks like a copy of old Verlinden part. with additional devices attached to it..
Sincgars radio parts (and part of gunner's platform). Judging from the instruction sheet the assembly of the set should be quite straightforward, of course once you manage to clean up and repair all the resin bits. The roof part of the kit has to be modified and its rear section removed. It seems to be easy task, particularly in comparison to removing some of the resin parts from casting blocks... 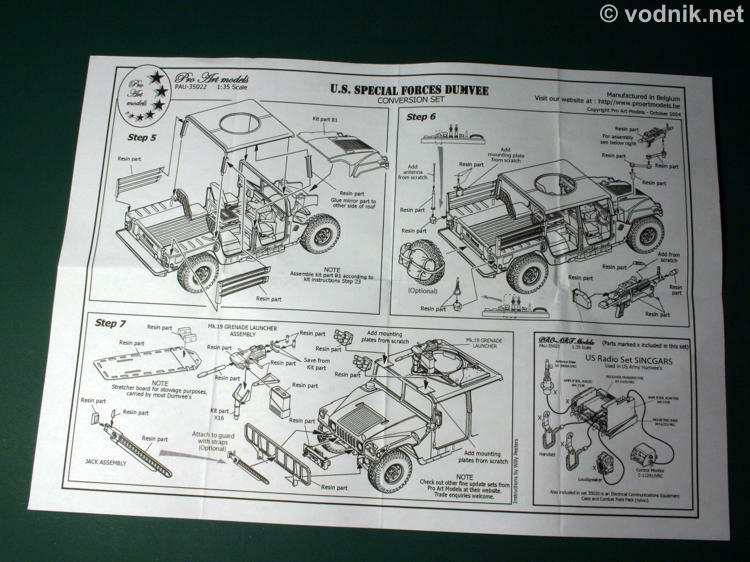 There are a few parts which have to be added from scratch. These are support plates for grenade launchers, mounting plate for one of the antennas, antennas themselves and one of the pipes for personnel heater. Unfortunately no templates for making these parts are provided in instructions, so modeler has to guess the proper size of them. Judging accuracy of conversion set is difficult, because photos of Dumvees are not that easy to find and as I mentioned earlier there are some variations of configuration of these vehicles. But still my photos reveal some details, which seem to be common features of all Dumvees and are not entirely correct in Pro Art set. For example my photos show completely different front seats in Dumvees from those included in the set. 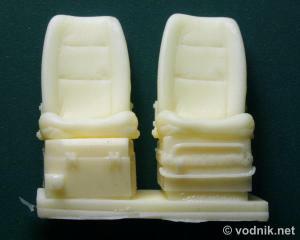 They are not the same as standard Humvee seats, but also not the same as those we get in the set. Resin parts look very similar to seats installed in new vehicles made by Military Systems Group, but older Army-modified ones (at least those on my photos) have simpler seats in them. It is however possible that some older Dumvees might have had MSG type seat installed as well, but I don't see them on my photos. UPDATE: I've found a photo of Dumvee - the same type of Army-modified vehicle as in Pro Art set - on which the new "MSG" style seat is visible. This means that seats provided in Pro Art set, while they seem to be less common type, are nevertheless correct and accurate. Other quite noticeable problem is weapons platform. We are supposed to use kit part with Pro Art set, with only weapon mount support frame replaced with resin part. 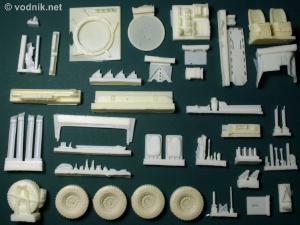 The kit part however is old style heavy weapons platform. In reality the weapons platform of Dumvee (and also most other new variants of Humvee) is of new lightweight type. It is different in shape - it does not have two triangular extensions on the side, which are very noticeable feature of older heavier platforms. Instead there is just one triangular plate supporting the hatch in open position. On Dumvees quite often there is a big ammo case tray / shelf added to the weapons station - it is not present in the resin set. Some of my photos show that radios in Dumvees are protected in a metal box / cage. It is not included in the set, but I'm not sure if this feature is standard to all Dumvees. Other minor problem is the size of "X" shaped antenna on the rear fence (GPS maybe?) and wiper motor on the windshield - both parts are much under scale. Both should be almost twice the size they are now. 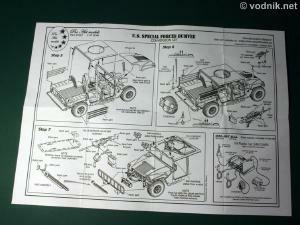 Some details of the front winch are slightly incorrect as well, but it is a minor flaw. It is worth mentioning that some Dumvees on my photos use different style winch, but the one included in the Pro Art set seems to be more common. There is a lot of critical remarks above, but I want to state clearly here that once properly assembled, the Pro Art set should look great and it will definitely look like Dumvee! Modelers more familiar with this vehicle however might notice mentioned inaccuracies and they need to decide by themselves whether problems are significant enough to influence their purchasing decisions. 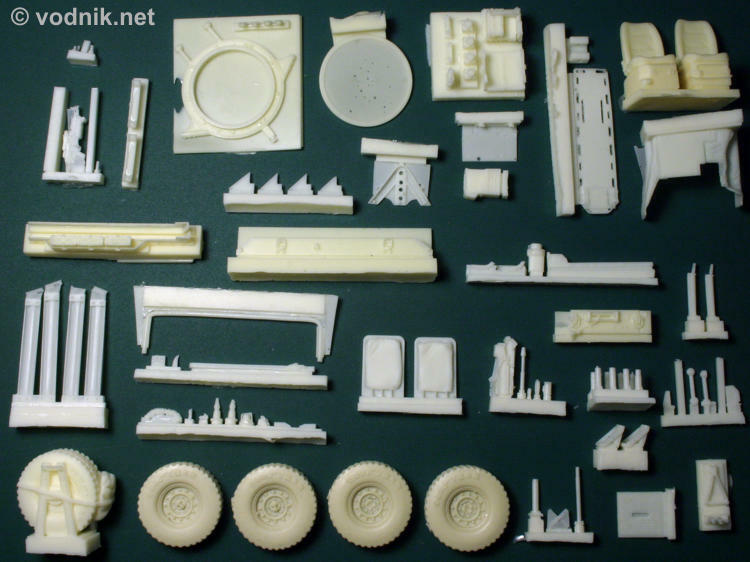 One thing is however very obvious - this set is not easy to build and some experience in working with resin parts is required. 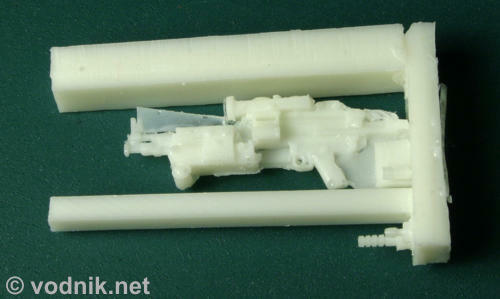 And this is not because the assembly process is difficult, as it is not (maybe with exception of not precisely described parts which have to be scratch built), but because parts require quite difficult cleanup process and some of them will need to be repaired by filling holes, straightening warps etc.. 40mm gun problem can be remedied very easily - simply don't use provided parts. Throw them away and use superior kit parts instead. Recommended with some reservations to more experienced modelers. ADDENDUM: I received some negative comments about my review, some even accusing me of not writing the truth. 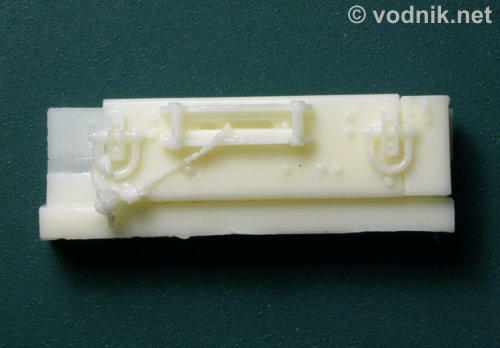 Some modelers claim that it is not true that there are air bubbles and damaged parts in the set, because they received perfectly good sets. But what I wrote is true for the set I received! It is good to hear that other copies of the set are better cast, but mine is exactly as described above.